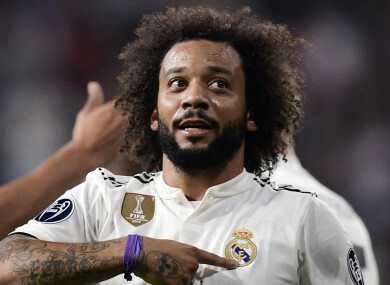 MARCELO HAS BLAMED jealousy on the part of the media for talks of a crisis at Real Madrid following a slow start to life under Julen Lopetegui. Lopetegui’s future in Madrid has come under fire following a five-match winless streak, though last night’s 2-1 Champions League victory over Viktoria Plzen offered some respite for the La Liga giants. Real sit level on points with Roma at the top of Group G following Tuesday’s result, but sit four points behind leaders Barcelona in La Liga. The former Spain head coach’s position is still believed to be in doubt, but his left-back was quick to share his belief that talks of crisis were down to “envy” from observers who don’t play the game. Marcelo was forced off in the victory at the Santiago Bernabeu, where the Brazil international sustained a knock. The 30-year-old, however, allayed fears that he will miss out when his club face off with rivals Barcelona this weekend. “I feel good now. I took a hard blow and referees have to see those things,” Marcelo said. Lopetegui also sounded hopeful that he would have the defender back on Sunday. Email “'All journalists try to hurt us, maybe it's envy because you don't know how to play football'”. Feedback on “'All journalists try to hurt us, maybe it's envy because you don't know how to play football'”.